To look at the event from the outside, it didn’t look like anything very special. It was a church picnic. We grilled some hamburgers, brats, and hotdogs. We planned some activities. We brought some food to share. In fact, to look at the event from the perspective of the weather, its kind of surprising that anyone showed up at all. In the time leading up the the publicized starting time, the skies looked ominous, and there were sprinkles. It looked so threatening that at the last minute, we decided to move the tables for eating into the building. We bought meat to grill for 100 people, and we began to wonder if there would be 25. They came, they came, and they kept coming. By the time we finished cooking (and a quick trip to the nearby supermarket to replenish the repast), almost 150 came. The energy in the room was high. The conversation was exuberant. The crowd spilled out the doors of the building out onto the patio where, even though no tables were set up, folks found a place to sit, eat, and enjoy each other’s company. And it wasn’t just one group in the congregation that came. People who have been members for 40 years came and people have been here less than a year came. The young, the old, the greatest generation, the millenials, families with kids, couples with no kids. It was an astonishing mosaic of the people of Faith. What happened after dinner was even more amazing. 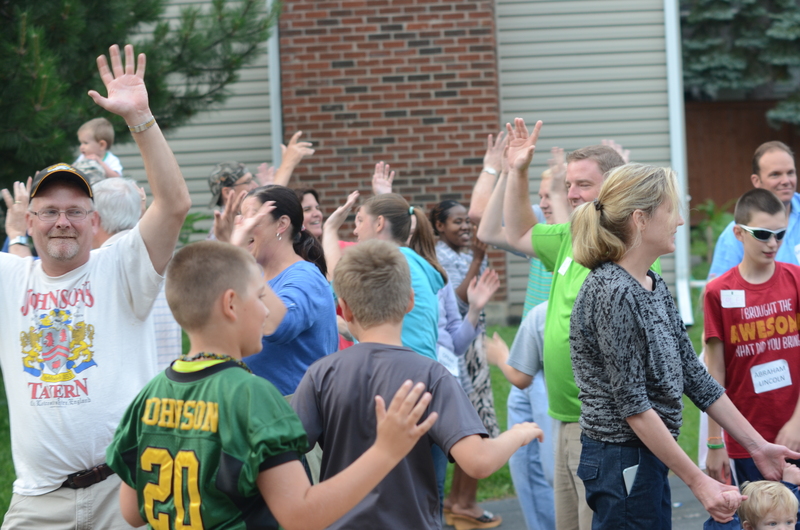 We wanted to get together for no other purpose than to celebrate God’s presence and action in our congregation. So, the plan was to have fun and play. When it was time to play, we invited everyone out onto the lawn and got them in a circle. We played a silly game that invited people into saying silly words and doing silly actions. People did it! The laughter and silliness going around that circle became infectious. Even those who didn’t join in the game began to draw in close just to watch and vicariously join in the antics. After the circle game, the game leader invited us to find a partner — someone not the same age as you, he said. My partner was Avery, a rambunctious first grader (give or take) who had written on his name tag, “The Mayor.” So, upon the direction of the game leaders, The Mayor and I got into the parallel lines facing each other when they began handing out the water balloons and the raw eggs. Yep, we did that. The luck of the draw gave The Mayor and me an egg which we proceeded to toss back and forth. The Mayor was astonishingly lucky; I don’t think he caught the egg once, but the soft grass kept on preserving the egg. Until it cracked on one of those tumbles into the grass and then broke when he tossed it back to me! But no worries, it gave me a chance to stand back and watch the remarkable thing that was happening as the young and old embraced this play together. After the games, we formed a new assembly on the driveway. One of our staff members climbed a step ladder and feigned a game of Simon Says. In reality, was teaching the crowd a series of dance steps. By the time she made the reveal, everyone was having too much fun to opt out. Yep, we did that, too. We danced on the driveway. Pherrel’s Happy blaring in the background. We wouldn’t win any dance competitions, but did we ever have fun. A few things have stayed with me in these days since that gathering. We probably don’t get together enough for no reason. Most of the time we invite folks together, there’s an agenda: we’re celebrating the arrival or leaving of a pastor, we have business to do, we need to ask for money, there’s something we want people to learn, there’s music to listen to or a new program to introduce. In this case, we invited people to come together and explicitly told them, “We are getting together for no other reason than to celebrate God’s presence and activity among us and to enjoy one another’s company.” And those who gathered embraced that agenda with extraordinary enthusiasm. At one point, I stepped back from the circle of silliness and just watched. I became choked with emotion as I began to wonder, “Where else does this happen?” Where else will you find the young and old and everyone in between, people who are not bound to each other by family ties, engaging in that very necessary human activity of play? Yes, in our culture we play softball and futbol and basketball, but that’s very different. Those are competitive activities that require some skill. We were playing together in non-competitive, no-skill-required fun that was packed with silliness besides. There’s something to be said for that, and we’d probably all be better off were we to do it more often. We, like almost every congregation I know, want to build genuine community. But that’s an elusive thing. I don’t think there’s a formula to it. By definition, community can’t be done casually or superficially. And it’s different than hospitality. It includes welcoming each other and the stranger, but it’s more than that. We work at it; we think about how it can happen. Sometimes it feels like we’re making progress; sometimes, I wonder. While I’m not sure why this particular event worked so well, I think we got some glimpses of what true community is like. And at something as simple as a church picnic. Go figure. This entry was posted in Uncategorized and tagged church picnic, community, play on July 3, 2014 by Jim Honig. Thanks, Bob! Wish you could have been there. Lovely. Thanks for the story. Thanks for taking a look, Katie! I got to meet one of your loyal parishioners at our Jazz Vespers last weekend! Playing is not easy for those of us who grew up in the German Lutheran communities. Thanks for the reminder. Being with my grandchildren helps. We recently spent time jumping the waves together on Panama City Beach.